These three pieces of writing were inspired by the above note, found lying in a puddle outside of a building at Microsoft by Cindy Meyers. Our friends at FOUND, a magazine that publishes anonymous notes and other objects found on the streets of North America, posted it on their website, www.foundmagazine.com , and let us use it here. We gave it to several writers and asked them to build a fiction around it. 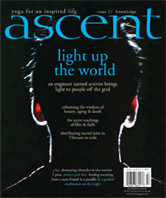 The diversity of the results is a testament to the relativity of perception and can be read in the current issue of ascent. It wasn’t the first time he’s seen such a thing, but it would be the last. Glancing to ensure that no one watches, he stoops and lifts the note from the puddle. He holds it with his left hand, pinched between his ring finger and thumb. Unconsciously obeying the note’s first command, holding it cautiously. The first time he reads the note, he remembers Sartre’s Nausea, the white paper, the blue lines, the bleeding. He wants his paper to be important. He wants to be important. Reading it the second time, he can congratulate himself that if it had been a 5-dollar bill he would have left it half submerged like a Chinese grain boat in the murky water. He never stoops for tawdry things. This note has to mean something. He reads it again savoring each word like a monk chewing rice, like a pornographer pouring over a print with a magnifying glass, like the last note in the Beatles’ A Day in the Life, like the dovetail joints in a Chippendale commode. “I see,” he says aloud. 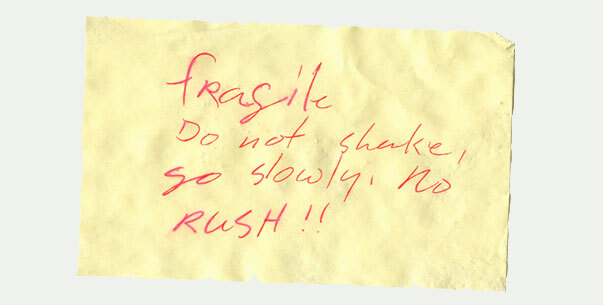 “Fragile – a musing on the tenuousness of the mortal coil!” “Do not shake - you catch more flies with honey than vinegar.” “Go slowly,” I must be on the right track. “No rush!” “There IS no rush, it was they who were wrong!” He thinks back to all of the people who have called him slow - his mother, his evil older brother - and feels the burning satisfaction of a vindicated fool, the good guy that always knew he should win and who finally wins. “I will never rush again.” He smiles at the note. The Author of the note looks down from her great height and shakes her head slowly. “No RUSH! !” she whispers breathless while materializing a Steinway piano above the puddle. The piano falls in a hurry, and when it lands the sound it makes is strikingly similar to 23-second final note in the Beatles’ A Day in the life. Comparve all'improvviso, come una fragile(fragile) stella precipitata (rushed) qui da chissà qual mondo. Sostava sui viali, vicino al cancello della casa di Carla, tra il cancello ed il benzinaio. Africana, labbra carnose, lunghi capelli neri, lisci, finti, lucidi come quelli delle bambole che da bambini regalavano a mia sorella per Natale. Abito succinto, indossato per mettere in generosa evidenza il seno e l'attaccatura delle natiche; stridente su quel corpo che ancora non aveva finito di spogliarsi della goffaggine dell'adolescenza. Aveva occhi grandi, inqueti, da gazzella in trappola, che si trasformavano in enormi buchi vuoti, senz'anima, appena qualche macchina rallentava (started to go slowly), avvicinandola. Allora il corpo prendeva a muoversi con gesti meccanici, ripetuti, da venditrice: mani sul seno a sottolinearne la procacità, bocca smorfiosa, tumida e chewingum in bocca, masticata facendo roteare e schioccare la lingua. A volte, dopo essersi accordata sul prezzo, saliva, altre restava ed il suo viso tornava ad essere quello di bimba. Il primo giorno che mi vide, comprese immediatamente che non sarei mai stato suo cliente, e mi sorrise imbarazzata. Le si leggeva chiaro in faccia che si vergognava di quello che avrei potuto pensare, per quello che faceva. Con i giorni si era rilassata e al mio arrivo sorrideva, lieta della mancanza di giudizio dei miei occhi. Quei pochi attimi che ogni sera trascorrevano tra il momento in cui suonavo al campanello e la risposta di Carla erano stati sufficienti per conoscerci, almeno con gli occhi. Una sera sono arrivata davanti al cancello della casa di Carla e lei non c'era. Al suo posto un'altra. E poi, dopo qualche mese, un'altra, e ancora un'altra. Sullo stesso punto, vicino al cancello, tra il cancello ed il benzinaio. Ragazze con occhi inquieti, da gazzelle in trappola. Nei loro occhi lei. Piccola, fragile, fulgida, stella cadente che, per un attimo, hai rigato il cielo notturno di questa città, risvegliando la mia meraviglio, ancora oggi, dopo tanto tempo, ti penso. Arrivo davanti a quel cancello, e spontaneamente butto l'occhio, per vedere se ci sei, e come sempre un pensiero "Dove sei? Dove sarai? Dove finiscono quelle come te quando diventano merce usata .... quando non scuotono (do not shake) più gli animi dei clienti spingendoli a comprare... ."